DAMBE DISTRICT, Kompong Cham Province – Lying on makeshift stretchers, seated in cheap wheelchairs, blind people wearing dark glasses, children with twisted limbs and slack jaws—all sat on the dirt clasping smoking sticks of incense and muttering quiet prayers Tuesday, hoping to be healed. For days now, since news spread of 2-year-old Kong Keng’s purported healing powers, the infirm, the lame, the sick and terminally ill have flocked here to dusty Khnor village, some having traveled from as far away as the borders of Laos and Vietnam. Among the hundreds waiting to see the child Tuesday, some were obviously dying and all were desperate. The toddler, rumored to be blessed with magical healing powers, is their last resort in a country with one of the worst health care systems in the world. “We came here because we heard the Magic Boy can heal,” said Meas Nara, sitting beside his son, Meas Phadith, 24, who was in his final year studying marketing when a motorcycle accident in May left him paralyzed from the neck down. Mr. Phadith lay on a reed mat bundled in furry blankets despite the humidity under a shade cloth outside the child healer’s modest wooden stilt house Tuesday morning. Mr. Nara said he had taken his son to see doctors in Vietnam after his accident, but they had been unable to help him. The child’s magic is their last resort, he said. “We came from Koh Kong prov­ince after we saw the Magic Boy on TV. It took days,” he added. The thousands now flocking to seek help from the child have been helped along in their belief by widely-watched reports on Hang Meas TV station and in articles in the popular Koh Sante­pheap newspaper. Asked if he was concerned that the boy’s powers could be nothing more than a figment of the im­agination or, worse, the scheme of charlatans—the boy’s family is charging about 4,000 riel for tree leaves said to have been blessed by the child—Mr. Nara demurred. According to the World Health Organization, Cambodia’s per capita government expenditure on health care in 2011 was $11.50 per person. In Vietnam it was $38.30. In Thailand the figure was $152.30. In Khnor village, due to the immense size of the crowds making the pilgrimage to see the child, and with hundreds camped in the shade of trees and hundreds more lining the path to the house, the residents of this village of 289 families are helping to organize the hordes of sick. Those seeking a one-on-one meeting with the boy, or even a bundle of leaves and sticks said to have been blessed by him, must form a line, sign into a logbook—listing their name, age, hometown and ailments. Then they must place their riel notes on a plate held by friends and family of the child, and also purchase a neatly packaged gift of water, incense, cigarettes and a can of Red Bull. These gifts, it was explained, are being given by the family to monks at a local pagoda. Once the cash and gift packages have been organized, they wait. Many had waited overnight on Monday, while over a loudspeaker it was announced that the child was feeling temperamental, and would only see the worst cases. For the others, a bundle of the blessed leaves must suffice. Hours passed. But there was still no sign of Kong Keng. Every 15 minutes or so, the voice over the loudspeaker—Kong Keng’s cousin, Choeun Sovannak, 23— made new announcements to keep the crowd informed. “The boy is on his way,” the voice said. Hundreds knelt and clasped their hands together, but the boy did not show. 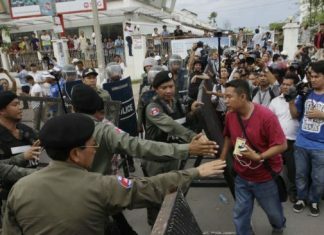 “Not everybody gets to see the boy,” said Kin Chin, a 31-year-old teacher from the village who was also helping organize the crowds. Sou Hen, the village chief, said that between 500 and 700 people a day are buying the bundles of leaves “blessed” by the child. People have been coming to see the boy since October 23, he said, explaining that those who buy the leaves are instructed to boil them in a kettle of hot water and drink the brew like tea—then they will be cured. “The family discovered the boy’s powers when he healed his grandfather who was ill,” Mr. Hen said, adding that he estimated the crowd at the village Tuesday to number about 1,000 people. “Sometimes he gets angry because of all the people and he goes away,” the village chief said. “The people who come here have tried other doctors and traditional healers and nothing has worked because they have incurable diseases like polio,” he said. Chhay Choeun, 57, who was seated on a mat in socks, boxer briefs and nothing else, said that he was cured, simply by drinking the Magic Boy’s herbs the day before. Mr. Choeun said that he had diabetes, and was unable to walk. “Now I am healing,” he said. Asked if he could stand up, Mr. Choeun said that he had not yet tried to walk, but felt he was gaining strength. “I’ve been sick for 10 years and the doctors couldn’t cure me. I feel release now,” he added. Seeking the peace and quiet of a relative’s house about 1 km from where the crowds had gathered in the village, the mother of the child Phat Soeun, 21, cradled her toddler in her arms Tuesday. “Yes, my son is magic,” Ms. Soeun said, explaining that the child had healed his grandfather, though she could not say what was wrong with him. “He feels sorry for the sick. But we needed a break, which is why we left our house. Too many people are coming now,” she said.